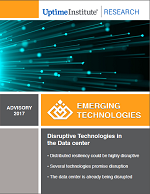 Abstract - In this report, Uptime Institute Research describes, assesses, and scores 10 technologies that many in the industry believe could change the data center market, and disrupt the ways in which data centers are designed, built, or operated. Proponents of individual technologies promote these as being powerful agents of change, or even as revolutionary, disruptive forces within the data center sector. During the course of our research, we found this to be true for some technologies, and less so for others.